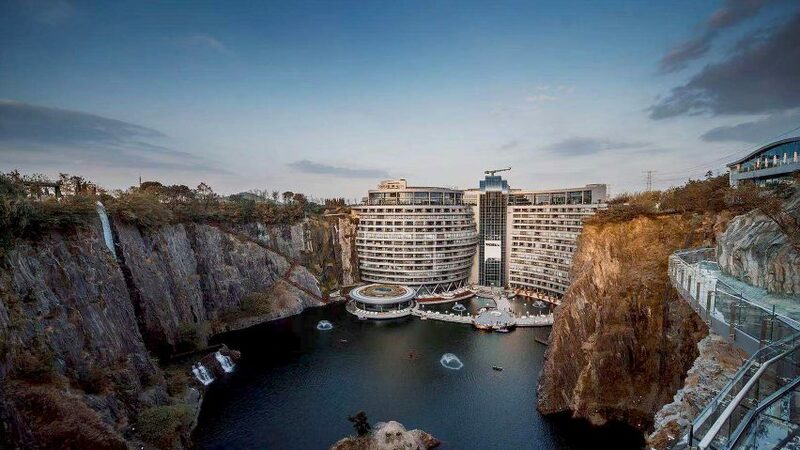 The Shimao Wonderland Intercontinental hotel has opened within a 88-metre-deep abandoned quarry near Shanghai. 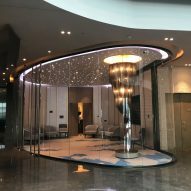 Designed by London- and Shanghai based Jade + QA, the 337-room hotel descends 16 storeys below ground level within the former quarry and is described by the studio as a groundscraper. Architect Martin Jochman created the concept for the quarry hotel while working for Atkins and it won a competition in 2006. He later established his own studio Jade + QA, where he carried on the design. "The concept for the building was inspired by the quarry itself and by its natural environment needing to be finely balanced with the new development following the using the Tao principles of yin yang," Jochman told Dezeen. The steel-framed building is attached to a cliff face on one side of the excavated water-filled quarry, with only two storeys rising above ground level and the lowest two floors descending below the water level. 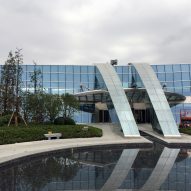 Rooms are wrapped around the walls of the quarry, with a "glass waterfall" structure containing the building's observation lifts and giving access to all the floors. "There are three principal elements of the building massing derived from the character of the site and its location, said Jochman. "The 'green hill'; the two storey green roof covered part of the building above ground level, the 'hanging gardens'; convex and concave S-shaped guest room wings; and the central glass 'waterfall'." 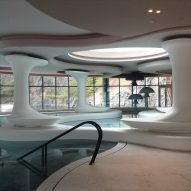 The hotel's public areas are located above and below the main rooms levels. The two storeys above ground contain the quarry hotel's reception, a restaurant and conference facilities. Swimming pools and further conference facilities are on the lakeside, 14 floors below ground level. 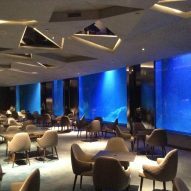 The two floors below water contain a restaurant and further bedrooms, which face onto an underwater aquarium. 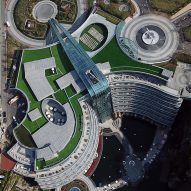 The unique location of the project, combined with the structural challenge of creating a tall building that is attached to the ground at both ends, meant that the hotel has taken 12 years to design and build. "The biggest challenge in my opinion was to satisfy the seismic and structural codes with an unprecedented building type – a tall building fixed at both ends – an inverted 'groundscraper'," said Jochman. 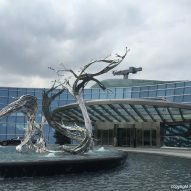 There were many other technical and operational issues associated with building in such unique and difficult location, including fire escape, safety from flooding and safety from rock fall." Although this is not the first quarry to be rejuvenated and repurposed for commercial purposes, Jochman believes that the hotel could be a blueprint on how to develop other redundant industrial sites. "We already have the Eden Project in Cornwall, or the Sunway in KL and few others, but yes the Shimao Wonderland Intercontinental is a great inspiration how to utilise difficult 'brownfield' site for the leisure use in a way which balances the natural and man-made environment," he said. Photography is by Blakstation & Kevin unless stated.